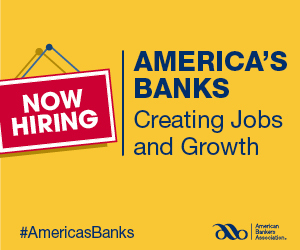 For the first time since its launch in 2016, ABA is expanding its “Americas Banks” ad campaign beyond the Washington area. For the first time since its launch in 2016, ABA is expanding its “Americas Banks” ad campaign beyond the Washington area. The campaign, which focuses on the important role banks play in their communities and the economy, will continue in Washington during the August congressional recess but also expand to select states across the country. Digital ads touting banks’ role in creating jobs and growth and in protecting customers’ money will run in a variety of locations now through the end of the month. All ads point readers to aba.com/AmericasBanks, a special website that spotlights the many ways banks help people and places grow. ABA continues to encourage bankers to participate in the campaign by using the hashtag #AmericasBanks in relevant posts on Twitter, Facebook, LinkedIn and Instagram. The association offers a free social media guide to help.